A damp spring prompts an increase in the mosquito population. This means that walking through the blooming garden or relaxing in a chair on the terrace will not be as pleasant as we expected. The bites of these annoying insects can discourage even a big fan of outdoor recreation from enjoying nature. That is why we should prepare ourselves to fight against mosquitoes before they attack us. At least, in our own yards. Mosquitoes love moist areas with dense vegetation. Swarms of these bloodsuckers can be encountered near rivers and artificial reservoirs. If there is a pond on a plot of land where your house is located, mosquitoes will commonly center around it. On the other hand, all insects evenly scattered throughout the site will certainly fly towards a lamp on the porch. In other words, you will be surrounded by the enemy in any case. For this reason, in order to protect yourself, your family and guests from dozens of itchy bites, you have to take drastic measures, which include both chemical and natural solutions. And that is what this article is about. You will learn about all available effective methods of combating mosquitoes in the yard, which are recommended by scientists. A comparison table of the effectiveness of these methods will help you to make up your mind, while a review of the best outdoor mosquito repellents offered on will become a useful guide in an ocean of seemingly similar products. Mosquitoes are repelled by a chemical substance, which is released by a mat when heated. Based on cedar oil, which disrupts metabolism in pests. Applied through a garden hose. Used by professionals. Spreads the insecticide over a large area. Low-toxic. Since any successful undertaking needs a plan, we have outlined the key points it should include. Habitat modification. Make your yard less attractive to mosquitoes. This includes installing yellow bulbs outdoors and removing the tall grass and dense vegetation. Treat mosquito breeding sites. Any yard has such a breeding site or a number of them. What you need is to detect all sources of standing water and to fix the problem. This can be done in the following ways: drain the container, refresh it, cover it with the lid, aerate the pond, stock it with fish or place there dunks killing mosquito larvae. The latter is usually based on Bti bacterium which is safe for humans and the environment. Another solution, methoprene, works by disrupting the insects’ growth. Create a barrier by applying residual insecticides. This will ensure a long-lasting mosquito control and prevent them from entering the house. You should do it in the evening, avoiding blooming plants since these insecticides are very potent. Just before the outdoor event starts, use foggers which produce a fast knockdown effect. They should be applied if you need to indiscriminately treat an area around you. Hose-applied pyrethroids are also of low toxicity but provide an extended mosquito control. For small and protected spaces like porch or garden-house, sticks or candles releasing such natural repellents as essential oils are suggested. You may place them directly on where the party is held and enjoy a mosquito-free evening. You may place there mosquito repellent lanterns or mats. They emit chemicals which are much more powerful than natural solutions but, on the other hand, are toxic. Before resorting to sprays, dusts and electronic repellents, inspect the area to find out whether there are favorable conditions for mosquitoes’ life and breeding. Eliminating the source of infestation will significantly contribute to the success of your mosquito control strategy. So, specialists from the Texas A&M AgriLife Extension Service suggest a number of quite inexpensive measures to reduce mosquito populations. First of all, keep in mind that mosquitoes need standing water to produce new generations. Therefore, inspect an area inside and around your backyard. Don’t limit your efforts just to your property since the fence separating it from other area is no obstacle for flying insects. For example, standing water may appear on the sites where your neighbors wash the car or as a result of using irrigation systems. Even small containers of standing water are likely to become home to mosquito eggs which over time would develop into full-fledged bloodsuckers. Don’t forget to check bird baths, empty buckets, old tires or even broken toys. After a rain, these items are filled with water and it takes a week or more for them to become a perfect breeding environment for mosquitoes. Refresh the water source, if you need it there. Small containers such as garbage cans should be covered tightly with a lid. If your problem is a pool, stock it with fish feeding on insects. Most likely, fish will do the whole job for you. Another trick which will help drive mosquitoes out of the pond is to aerate it. Remove weeds in and around the pond. This will expose the water to the wind which will create waves annihilating mosquito larvae. The latter are capable of surviving only on the water’s surface since they need to breathe, while the wind will just drown them. The thing to do next is to remove dense foliage. Cut the tall grass and trim shrubs. These are sites where mosquitoes typically rest in the daytime. And, finally, you should reduce the source of light coming from your house during the late evening and at night. As we know, the light is a potent attractant for mosquitoes. But there is a nuance. The insects perceive different spectra of light differently. For this reason, James A. Wilson with South Dakota State University recommends using yellow light bulbs because they are a third less attractive to nocturnal insects, compared with a conventional bulb emitting the white light. Such yellow lamps will not make bloodsuckers totally ignore your place but, according to scientists, will substantially reduce their number around you. If you have decided to get rid of mosquitoes in the yard, you should first target their larvae. These bloodsuckers are much easier to detect and annihilate when they are at a larval stage and congregated in standing water containers, than when they are grown insects flying all around you. Researchers with South Dakota State University say that the most common products for such purpose are those based on proteins derived from Bacillus thuringiensis subsp israelensis (Bti), which is toxic to mosquito larvae but safe for humans, animals and fish. Place the granules in the standing water and they will poison young bloodsuckers in a period between three days and a month. Another type of larva-killing solutions is based on methoprene. They are insect growth regulators, disrupting the pupae growth into the adult. However, as soon as the insects become mature, the effectiveness of these solutions dramatically drops. Now, let’s have a look at options of the adult mosquito repellent for yard. Scientists from Iowa State University claim that pyrethroid insecticides are the best bet for treating lawns and gardens. They have numerous advantage including low toxicity and the absence of the smell. But there are downsides and the major one is that pyrethroids almost haven’t residual activity and are short-time solutions, which is why you should apply them right before the planned outdoor event takes place in the yard. But how often should you spray? Actually, it depends on weather conditions, because you cannot treat the same site again until the previously applied insecticides have dried. And this may take longer than expected in case the level of humidity is high. Spray these insecticides all around you, on plants, surrounding objects and whatever, and yet, take care to not overdose, otherwise, you may harm beneficial insects. In order to temporarily suppress mosquitoes, apply short-lived and non-residual fogs to the yard. By means of fogging it is possible to cover a large area without damaging the foliage. You may use portable thermal foggers that convert an insecticide, mainly resmethrin, into a thermal fog. Such devices operate either on propane or electricity. For those willing to take more drastic actions, hose-applied pyrethroid insecticides have been produced by some companies. According to researchers at the Texas A&M AgriLife Extension Service, despite the fact that broadcast insecticide application is not a good choice because of the risk it poses to beneficial insects, hose-applied products are recommended since they provide an extended mosquito control. Meanwhile, scientists with South Dakota State University point out to the fact that thermal foggers eliminate insects only on contact, affecting them with the insecticidal fog, which dissipates within hours, though. Instead, they suggest a barrier treatment of mosquito resting areas around the yard and house. Such anti-mosquito barriers can be created with the use of an ordinary household or hose-end sprayer or ready-to-use container with a spray gun. With these devices, you can apply residual insecticides containing bifenthrin, deltamethrin, cyfluthrin or permethrin. These compounds penetrate foliage but settle more quickly. Nor do they produce smoke, unlike thermal foggers. This approach provides a longer effect — up to a month. When spraying, pay attention to shrubs, trees, shady areas around the building because mosquitoes usually rest during daylight there. Particularly, this concerns sites close to doorways and windows which are mosquitoes’ entry points inside the house. Since residual insecticides lastlonger, you may apply them in the evening in order to avoid any harm to beneficial insects. For small areas, repellent lanterns, heat-activated repellent mats and sticks can be used. As scientists from the University of Georgia indicate, such devices have been proven to be highly effective at repelling bloodsuckers. When heated, they release allethrin or other pyrethroids which repel insects. Burning sticks or candles based on natural repellents is a safe way to protect yourself from mosquitoes, however, there is a number of downsides. Experts at the University of Wisconsin-Madison highlight that candles emitting citronella have been tested by scientists. The results have shown an insignificant effect with just a small portion of mosquitoes being repelled. At the same time, candles based on other plant essential oils, such as linalool and geraniol, are more powerful but yet produce a moderate effect. When used outdoor, geraniol candles are capable of protecting people within a range of one meter. Also, they work better in protected spaces with a low air flow. Below you will find a review of various mosquito control products, which are the most popular ones. We have examined what kind of repellents will be the most appropriate for patio — candles, incense sticks, and repellent mats will do the whole job for you while you are relaxing outside in the evening. We have compared five insecticides with different natural and chemical active ingredients, which are intended for treating a large areas in the yard or garden. All of them should be connected to a hose, what enhances their effectiveness. Another approach implies using a fogger, which is why we have picked the best one and also mentioned the insecticide intended for it. And finally, there is an insecticide based on natural bacteria, which eradicates mosquitoes at a larval stage. This product is a good alternative to chemical sprays, which allows enjoying the outdoor activity without bothering with preparations ensuring the protection from mosquito bites. Just place it nearby, turn on and have a good time! Thermacell is compact and has a stylish design, making it chime in with the surrounding atmosphere of any party. Once a repellent mat is activated by the heat generated by the device, it releases a chemical compound into the air. The latter acts as a repellent on mosquitoes, deterring them from the area within the range of 15 feet. At the same time, it has a robust design and is waterproof, so feel free to use it under any weather condition. The product comes with one outdoor cap, three repellent mats and a butane cartridge. The drawback is that the cartridge is not refillable and you will have to purchase new refill packs after it is expired. Its rating on is 3.8 out of 5 stars, with most of the customers giving it either 4 or 5 stars in their reviews. users have noted that in windy weather, Thermacell is not that effective. But on the other hand, mosquitoes are not active in the windy environment either. “This product really does work! It’s unfortunate that you have to keep buying refills on the pads and butane but the alternative is to keep buying sprays to put on your body, sprays for your yard, zapping tennis racquets and their batteries!” a customer wrote. In case you are unwilling to deal with chemicals, take advantage of another invention in the field of mosquito control. This is about candles designed to repel bloodsuckers. Once lit, cutter candle works for 30 hours and targets many species of flying insects. When the oil is infused in a wax candle, the odor is released in a cloud of smoke repelling mosquitoes. The repellent is based on citronella oil, however, as we have revealed, scientists do not consider this ingredient to be good at deterring mosquitoes and advise using other essential oils for this purpose. And even though we assume that citronella oil works on mosquitoes, as the manufacturer claims, its range is significantly narrower than that of Thermacell, amounting just to 3 meters. Apart from that, bear in mind that citronella oil may turn out to be toxic to your pet, especially cats. The advantage lies in the product’s being natural and safe for most people. Moreover, it emits the odor appealing to humans and will contribute to a relaxing atmosphere of the party or barbecue. The seller suggests placing candles 18 inches apart and using a number of products at once in order to maximize the mosquito barrier. Its rating is 3.8 out of 5 stars. “I use two of them on an 8′ x 16′ porch and they are very effective. Having a roof helps keep the citronella scent prominent,” a customer noted. Some users say that they prefer not to place the candle too close to them in order to avoid inhaling the fumes directly. According to them the nest location for this stuff is beneath a table or on the floor. Another unconventional mosquito repellent based on essential oils is more popular on but more expensive. Incense sticks work approximately the same way but have a blend of natural ingredients including citronella, Brazilian Andiroba, rosemary, and thyme, with a concentration higher than that in the candles — 10% essential oils. One package contains twelve sticks, with the length of 2 feet each. Still, compared with the previous product, a burn-time of each stick is less and amounts to about three hours. To activate the repellent, lit the stick, waits about 30 seconds until the flame catches it, blow out the end, then insert it into the ground or a pot. Now, its aroma will create a pleasant zone for the patio and drive flying insects out! Its rating is 4.2 out of 5 stars, with over 900 customer reviews. “I always surround our patio with these when we have people over and some spots are close as 2-3 feet from where people are sitting and nobody seems to mind. Most people actually say they like the smell and have asked me where I purchased them,” a satisfied customer wrote. Some customers were worried about a risk of causing a fire since there is no base for the sticks supplied with the product. Remember that stick burn down to the bottom, so make sure that they are at a distance from bushes or any inflammable object. We should draw your attention to the convenience of the spray’s application. What you need is to shake it well and connect its nozzle to a hose, which allows to cover a broader area and obtain the best result. Be sure your kids and pets don’t enter the treated site until the liquid has dried. Now let’s have a look at traditional ways of keeping mosquitoes away from the backyard and garden. This spray based on lambda-cyhalothrin both kills on contact and repels flying insects. According to the seller, a 32-ounce container covers an area of 5,000 square meters. Lambda-cyhalothrin falls into a category of residual insecticides, which means that its effect lasts for a long period of time. In this particular case, the product ensures the protection against mosquitoes up to a month, even after rains. However, if you are planning an outdoor event, you should spray the area 10 hours before it starts. Its rating is 3.9 out of 5 stars, with 26% of the customers giving it just one star. Why? Some of the dissatisfied customers say that the product did not make any difference and it was not a sort of “a magical spray.” Actually, you should not expect a miracle when it comes to pest control solutions. Multiple factors such as weather conditions and severity of infestation impact the effectiveness of one or another repellent. Some homeowners refrain from using chemical sprays and consistently opt for natural solutions so that trees, shrubs, and flowers cannot be harmed. That is why producers have developed repellent which can be almost as effective as chemical ones. This mosquito repellent for yard contains natural essential oils and ingredients based on plants, such as eugenol and peppermint oil. The method of application is the same — by means of connecting the container to a garden. The area coverage is 4,500 sq ft, but bear in mind that, despite the natural content of the spray, it is intended for outdoor use only. One of the product’s advantages highlighted by the seller is that it is stainless regardless of the kind of surface it is applied to, be it the lawn, kennel or patio. For those appreciating domestically produced goods, here is another strong point of this spray — it is made in the USA. Its rating on is 3.8 out of 5 stars. Customers confirm that the solution is safe for vegetation in their gardens. “I have safely used this on my grass and other plants with no side effects except the lack of fleas, ticks and mosquitoes!” one of them wrote. And yet, some users doubt that the stuff works exactly against mosquitoes. A mosquito repellent for yard containing lemongrass oil is one more natural solution which both eliminates and repels mosquitoes. With the same volume and coverage area — 32 ounces and 5,000 sq ft respectively — it is two times cheaper compared to the previous repellent. The hose-end sprayer attaches easily to a garden hose so that you can treat the entire yard quickly and without mess. According to the manufacturer, this formulation has been tested scientifically and proved its efficacy against mosquitoes. It seems that Cutter Natural repellent is the least popular among users, rating just 3.0 out of 5 stars. About a third of them claim that it cuts down pest populations at most for a day or is totally ineffective. However, others disagree. “My husband sprays the bushes around the pool morning and evening for a few days after a rain and we are mosquito free until the next big rain,” a customer wrote. Well, it seems that some of you would consider a more powerful concentrated repellent. Here is a solution based on permethrin, a long-lasting insecticide, which will ensure the protection against mosquitoes. In normal conditions, Summit Mosquito Barrier is effective as long as four weeks and covers as much as 10,000 sq.ft. Like the previous products, the liquid is sprayed through a hose connected to the nozzle. The label direction suggests spraying the areas where mosquitoes usually rest, i.e. shrubs and dense vegetation. The stuff will create a reliable barrier protecting people not only outside the house but also indoors as it will prevent pests from penetrating there. However, if you have pets, do not let them out for an hour or more after spraying and only when you are sure that it has dried. Its rating is 3.6 out of 5 stars. “My husband sprayed the perimeter of our property and the grass while wearing a mask and the next day everything was dry. Not sure what mosquitos don’t like, but I like that they’re not on my property,” a customer wrote. One of the arguments in favor of using foggers is that it is a tool of professionals. With this device in hands, you may annihilate or repel mosquitoes spreading the insecticide over a large area of the garden. 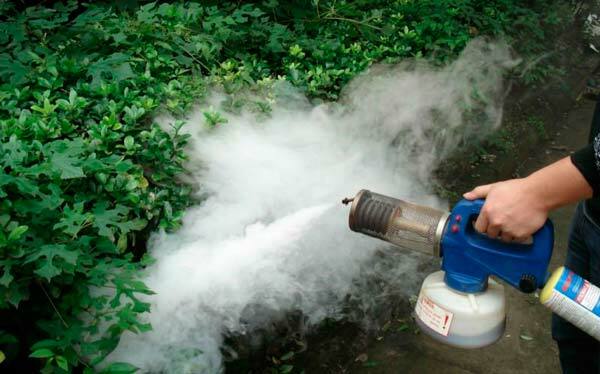 Normally, insecticides of low toxicity come with foggers so that the damage to vegetation can be minimized. According to the label description, Burgess 1443 Propane Insect Fogger covers an area of 5,000 sq ft. Also, the fog disperses very quickly, within several minutes, after what anyone can safely enter the area. On the other hand, if to compare foggers with sprays, some downsides should be highlighted. In this particular case, fogging produce a short-term effect lasting up to six hours. Not every insecticide can be used with each particular fogger. For this one, Black Flag 190255 Fogging Insecticide is intended. It is a ready-to-use and odorless insecticide. As the seller put it, “the secret is in the microscopic particles Black Flag Foggers or Burgess Foggers produce – up to 7x finer than mist”. The fog penetrates into mosquito harborages killing or repelling them. It works fast and an average-sized yard can be treated within minutes. Both the fogger and its insecticide are popular with users, rating 4.1 and 4.0 out of 5 stars respectively. “I moved to the Upper Peninsula of Michigan last June and I am building a cabin. The mosquitoes were terrible, we had to wear nets and long sleeve shirts and pants. Then I bought this fogger and it was amazing that we were able to work outside in shorts and no face nets. Great product,” a customer said. It is much easier to eradicate mosquitoes at a larval stage for many reasons, but primarily because eggs and larvae are more vulnerable and they are easy to detect because mosquitoes breed in the standing water. So, what is needed is to discover all such sources and either empty them or, if it is impossible, place there mosquito control bits. This product contains corn cob granules coated in Bti bacteria, which is environmentally friendly and safe for anyone except flying insects. Bear in mind that this insecticide affects only eggs and larvae, so you will not have to bother with picking up dead insects in the water. But this means that you have eradicate the entire generation of mosquitoes that would have emerged from these larvae. Its rating is 4.1 out of 5 stars. As one customer noted, “I’ve been putting the bits in the standing water in our yard, and I think I’ve seen only one mosquito all year. Normally at this time of year, I literally cannot walk 10 feet to my car without being attacked by several mosquitoes at all times of the day or night”. Spray based on eugenol and peppermint oil.